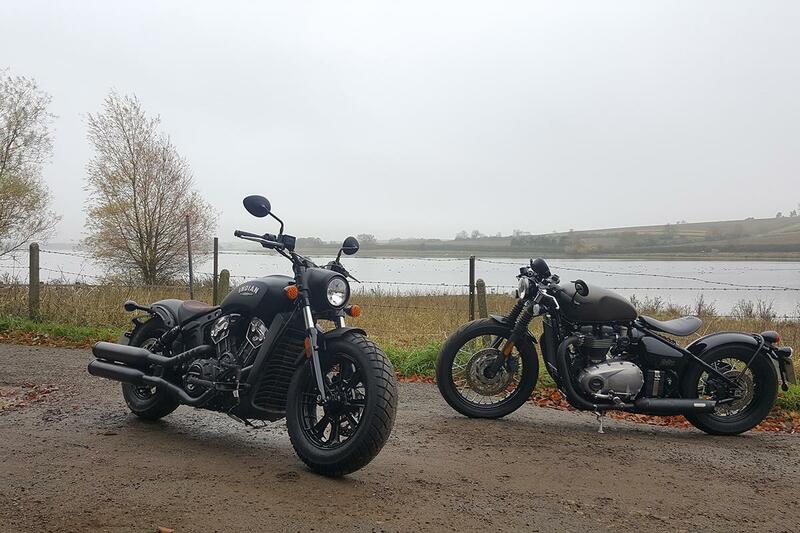 When Chief Road Tester Michael Neeves rode the Triumph Bobber for the first time at the end of 2016, he was incredibly impressed. Fast forward to the back end of 2017 and the Triumph Bobber was crowned our cruiser of the year. But now the Triumph has competition from the other side of the pond. Enter the Indian Scout Bobber. Since the Triumph was the first production bobber on the scene, it set the benchmark for all other bobbers to follow. When the press release from Indian landed in my inbox I was eager to see the new bike. I was disappointed. When it comes to styling, the Indian doesn't get anywhere near the Triumph. At a glance it's incredibly difficult to differentiate it from the standard Scout. This wouldn't normally be such a big deal, but these bikes are all about style. It's the same story in the saddle. Bobbers are supposed to be minimalist, which the Triumph is. The Indian on the other hand feels bulky and cumbersome in comparison. The wide bars and forward-position pegs make it feel like any other cruiser. It made me realise just how good the Triumph Bobber is. Riding it every day it's easy to get used to the handling and performance as the norm, but back-to-back with the Indian it's clear the Triumph is streets ahead. The 1200cc parallel twin only produces 76bhp, compared to the 94bhp of its American cousin, but thanks to a lower weight it feels much perkier. The parallel twin has bags of character and sounds great - even with the standard pipes. The 1133cc V-twin lump in the Indian just lacks character. It's smooth, but it's lacking that X factor. It's the same story when it comes to the handling. The Indian handles exactly as you'd expect a cruiser to handle. It's OK, but it's quite soft and wallowy. The Triumph by comparison feels taut and nimble. The smaller size of the Triumph also makes it easier to man handle. Which would I go for? Well, I know I've had my issues with the Triumph this year, but for me it's the better bike. It looks better, goes better and handles better. The Indian does have a larger fuel tank, though, at 12.5 litres. If you want a slightly more traditional cruiser, go for the Indian. But The Triumph Bobber is still at the top of the Bobber class. By a long way.